There are numerous variations in the production of rum, as the location, among other things. These variations result in rums with different colours and flavours, though they always keep a distinctive taste. According to the EC 110/2008, in Europe, the term rum is the spirit drink produced exclusively by alcoholic fermentation and distillation, either from molasses or syrup produced in the manufacture of cane sugar or from sugar-cane juice itself or a mixture of the three of them. Distilled at less than 96 % vol. so that the distillate has the discernible specific organoleptic characteristics of rum, whith a volatile substances content equal to or exceeding 225 grams per hectolitre of 100 % vol. alcohol. The minimum alcoholic strength by volume of rum shall be 37,5 % and no addition of alcohol, flavouring or any other substance but caramel, as a means to adapt colour, shall take place. Among rums we can find a wide variety of differences. Rums can be distinguished on the basis of the production process: industrial or agricultural; the raw material used: sugar-cane juice and molasses; the yeast used for fermentation: natural or cultivated; the time of fermentation (from about twelve hours to 12 days); the distillation process used: still production or distillation columns. Colour and, of course, aging time are also distinctive characteristics of the rums. 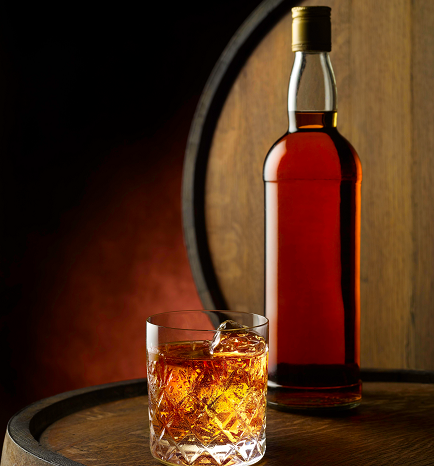 Nevertheless, it is difficult to classify rums by types or ages, because they are produced in many countries and each one has its own legislation and there is no agreement for a standard classification, therefore there are different terms, which cannot be used as general distinguishing ones. That is why in Bulk Wine & Spirits, we prefer to differentiate by origin.